Tigers of the Raj. The colour, splendour and epic sense of adventure of the palaces of Rajasthan inspired these rhythmic compositions, which form a lavish and romantic musical feast – an entertainment fit for maharajah. A worthy successor to James Asher’s hit album Feet in the Soil, Tigers of the Raj blends the rich interlocking rhythmic textures of tablas, dhol, douffli, ankle bells, manjira and dholak, with the haunting sounds of Indian voices, swaramandala, santoor, sarangi, flute, sitar and modern keyboards. Never has Indian fusion sounded this good before! Following the success of Feet in the Soil, James Asher returns with a new album inspired by the magical power of Rajasthan, the ancient Indian “Land of Kings”. The ten pieces in Tigers of the Raj trace a journey to Rajasthan, the land of princely dynastic rulers, elegance, and stark beauty. Rhythmic elements, also used in Feet in the Soil, underpin the wider range of themes that characterizes the album. The power, splendor, color, and epic sense of adventure found in the ancient palaces of Rajasthan made a profound impact on the author who here attempts to orchestrate moods and feelings evoked by his journey, weaving together modern techniques with ancient sounds in a musical score fit for a maharajah. State-of-the-art hard disk recording techniques are tastefully and expertly combined with magnificent musical productions by Indian artists. The santoor play of Kiran Pal Singh (who is one of only five disciples of Pandit Shivkumar Sharma) is enhanced by the infectious conga playing of Miles Bould (who has frequently toured with Sting). World renowned frame-drum player Glen Valas here joins guitarist Volker Grun, who flew especially from Germany to contribute more of the unique swing that previously enriched Feet in the Soil. Twenty musicians in total join here to co- create this impressive tribute to Indian culture and art and evoke in music the experiences of a traveler journeying through the “Land of Kings.” The album is further uplifted by acoustic percussion’s, sitar, santoor, sarangi, flute, and the voices of several Indian singers used to create a magical musical atmosphere. 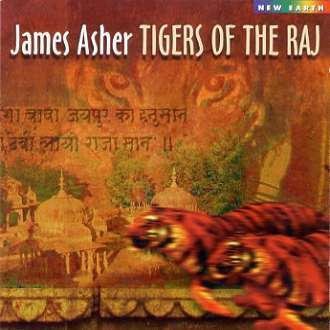 Like in Feet in the Soil, James Asher uses drums as the base of his musical composition Tigers of the Raj. Rajasthani drumming rhythms were created in consultation with Sandeep Raval, a remarkable table player and expert of Indian folk music. Contemporary Western dance sounds were added and also melody, contributed by Craig Pruess, both a keyboard player and an expert in sitar, tambura, and swarmandala instruments with twelve years of experience in the study of Indian music. Pruess wrote the music for motion picture Bhaji on the Beach, and also produced Cliff Richard’s Silver album. The trance-like opening piece Temple Gates is characterized by a hot and driving tempo, enriched by the duj-djun’s of Peter Lockett (who is the percussion player on the musical score of the James Bond feature Tomorrow Never Dies) and the dhols of Johnny Kalai (whose Dhol Foundation was the opening act in the concert given by the BBC in honor of India’s soth anniversary of independence featuring Ravi Shankar.) A haunting and ethereal female voice opens the temple gates of this mesmerizing piece, leading the listener into the heart of the composition and beguiling one to join the dance. Who is She? Is She a Rajasthani Temple Priestess? Her enchantment is an invitation to enter the hypnotic sway of the dance that climaxes with the sounds of guitar and sarangi. James Asher’s new album is a welcome surprise; it honors the richness of Indian classical music and weaves it with variations on Western rhythms. Enhanced by the quality of its excellent production, Tigers of the Raj stands out as an original album of world music with broad appeal. From the haunting themes of Red Desert to the majestic finale of the last track, its melody, groove, and atmosphere make it an all-absorbing experience. Never has Indian fusion sounded this good before! Written by TJE NAPRA June 2000. Reproduced with permission from the New Earth Records web site. Credits : Recorded and produced by James Asher at Starfield Studios – London. All compositions by James Asher, except Red Desert and Nataraj Express co-composed by James Asher and Craig Pruess. Tracks 1,2,4,5,6,7,8 & 9 co-arranged with Craig Pruess. Mixed by Grahame Gerrard and James Asher at Starfield Studios and Capture UK. New Earth Records. [NE 9805-2] 1998. James Asher: Keyboards, Percussion and Soundscape. Sandeep Raval: Tablas, Dholak, Tassa, Djembe. Johnny Kalsi: Dhol. Sumeet Chopra: Tablas, Douffli, Tassa, Keyboards. Kiran Pal Singh: Santoor. Kiran Thakrar: Keyboards. Glen Velez: Frame Drum, Reik, Percussion. Billy Wilmington: Drums, Darabuk, Ankle-Bells. Tom Eldridge: Djembe. Chhaya Vachharajani: Vocals (Tracks 6,7 & 9). Swati Natekar: Vocals (Track 3). Pandit Vishwa Prakash: Vocals (Track 8). Dinesh K Mahavir: Vocals (Track 4). Mohan Parmar: Manjira. Al Gromer Khan: Sitar (Track 10). Surinder Kamath: Flute. Volker Grün: Guitar. Craig Pruess: Sitar, Swaramandala, Tambura, Keyboards. Surjit Singh: Sarangi. Peter Lockett: Djun-Djuns, Chapa, Kanjira, Cymbals. Miles Bould: Congas, Timbales. Arthur Hull – America’s premier Drum Circle facilitator and Remo signature series drum designer.